I’ve seen quite a few Bighorn Sheep, but I rarely photograph them in the spring or summer as to me they always look best in the winter. I also really don’t care too much about the ewes. I find their appearance to be very alien and more than a little un-settling. Now the lambs that is a whole new story. In a word, adorable. They were so cute and fun to watch that I broke a cardinal rule and photographed despite some harsh light. If you are keeping tabs over these last few trip reports from Yellowstone, you know I had difficult weather to deal with. 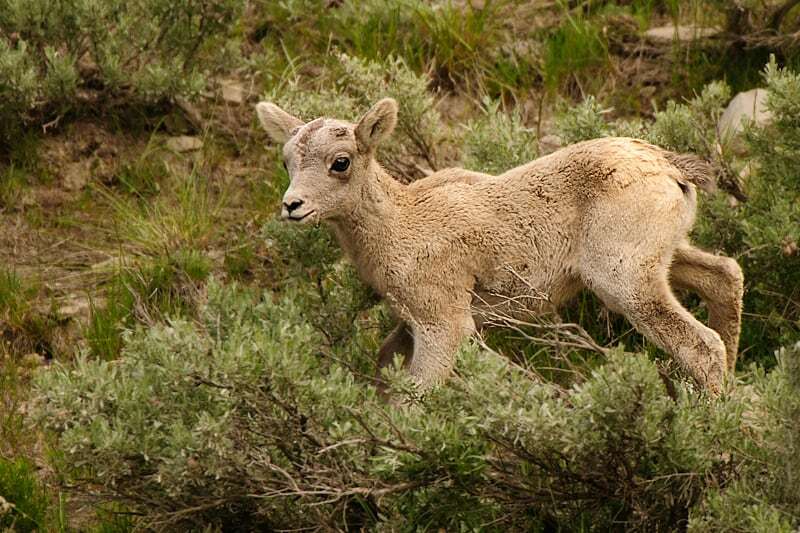 They were so cute that I had to photograph a few of these lambs. So enjoy them for the capture they are and sort of ignore the light. 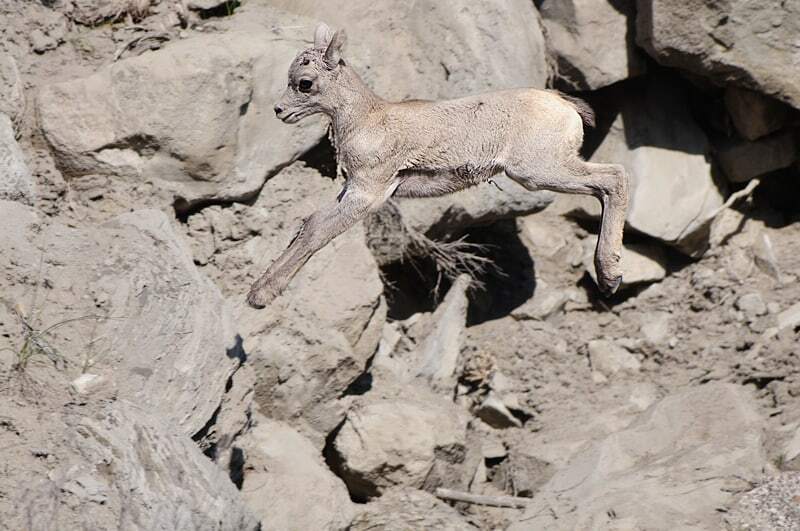 The Bighorn lambs in these images are about 5 days old and already ready to leep great distances as well as run with their moms. Which is a good thing when you have Golden Eagles hunting them too! 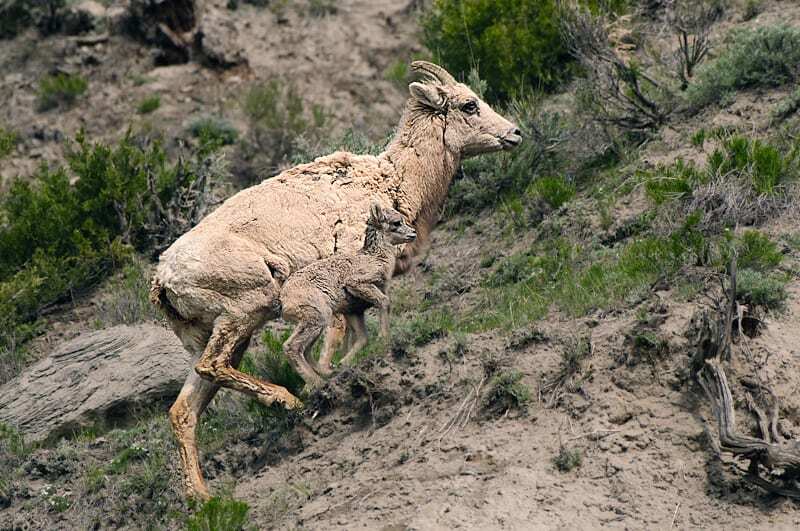 Bighorn ram’s horns can weigh 30 lbs (14 kgm)—more than all the bones in his body combined. They have split hooves which aid in balance and rough hoof bottoms for natural grip. 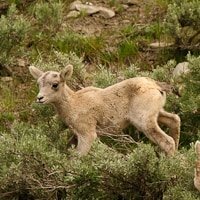 You can see all of my Bighorn Sheep photography and order prints…HERE. Here’s the map of the top secret location for finding the bighorn lambs! Ok, it isn’t really top secret, but it is where I found them most evenings.